Saint Raymond Nonnatus is a Spanish saint surnamed “Nonnatus” meaning in Latin “not born.” He was “not born” in 1204 and died in 1240. He received the nickname “not born” because he entered this world by caesarean section – an extremely rare phenomenon in the 13th century. His mother died in labor and so they cut open her belly. The baby was still alive. This was taken as a sign that God had special plans for him. He was “ransomed” and his life was sacrificially dedicated to merciful act of ransom. 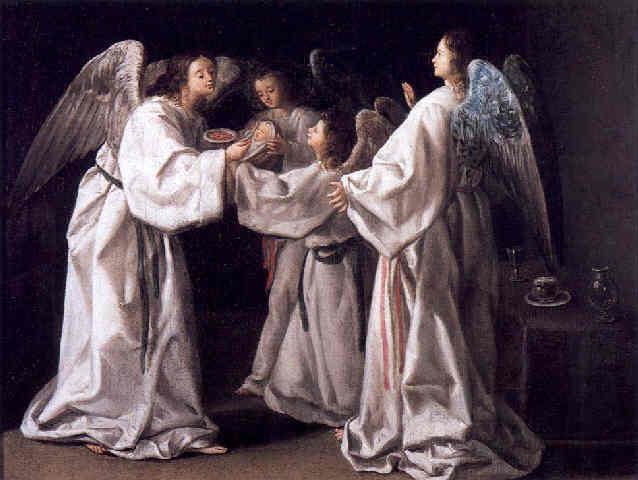 The painting above shows the infant Raymond Nonnatus being cared for by angels since he entered this world without a mother. By the way, Saint Raymond is one of the patron saints of pregnant women and childbirth. So he’s a great saint for Catholic families. His miraculous birth was the beginning of a miraculous life. He was a contemporary of St Dominic and St Francis, but did not join their orders. Rather, Saint Raymond became a member of the Mercedarian Order in order to ransom Catholic captives from the Mohammedans of North Africa. He traveled to North Africa and is said to have surrendered himself as a hostage when his money ran out. Even as a slave, Saint Raymond continued his priestly ministry and preached the Gospel of Jesus Christ to the Mohammedans. Troubled by his preaching, the Mohammedans punctured a hole through his lips with a hot iron, and padlocked his mouth to shut him up permanently. Saint Raymond was ransomed by his order and in 1239 returned to Spain. He died at Cardona, sixty miles from Barcelona in AD 1240. In Mexico City, the faithful leave padlocks on the altar dedicated to Saint Raymond as votives against gossip and slander! This hearkens back to the saint having his own mouth pierced and locked up. Pope Paul VI removed this great saint’s feast day (Aug 31) from the calendar in 1970. A big mistake in my lowly layman’s opinion. Saint Raymond Nonnaturs, pray for us!